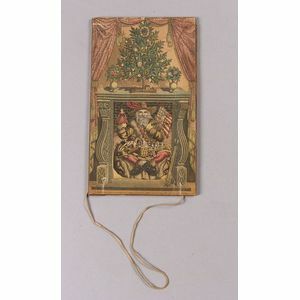 Animated Christmas "Card" by J.G. 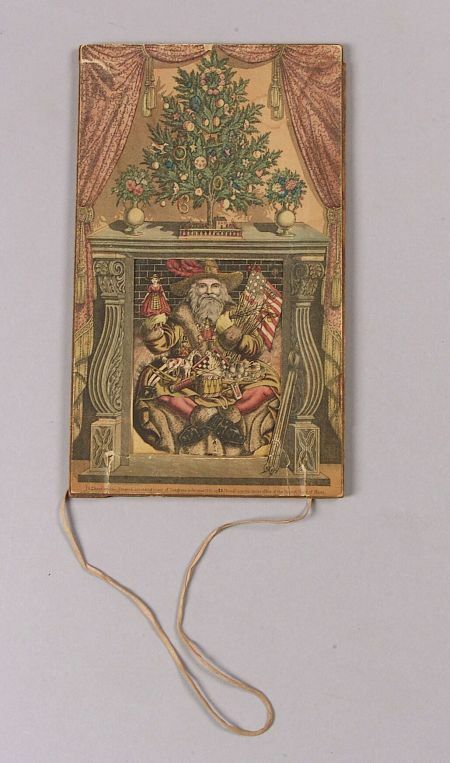 Chandler Lithographer, 1858, Santa in the Chimney mechanical toy in a wooden frame with paper litho front depicting a fireplace with a Christmas tree on the mantel and the image of a fanciful Santa Claus holding numerous toys and an American flag seated inside the fireplace; the pull-string mechanism raises and lowers Santa up the chimney; on the reverse is printed The Night Before Christmas verse and Published by J.G. Chandler, 3 Guild Hall, Roxbury, Mass., (general wear, mechanism does not work, tears to paper but intact, water stain at top), overall 6 1/2 x 10 3/4 in.